These signs help keep both employees and customers safe by restricting access to certain areas of a store. While the general store area is normally safe from obstructions and hazards, the back room may not always be so, what with stacks of merchandise and boxes everywhere. This is especially true when new stocks are delivered and have not yet been stored properly. These signs ensure that customers don’t wander into these potentially dangerous areas and significantly lowers the chance of accidents and possible lawsuits. 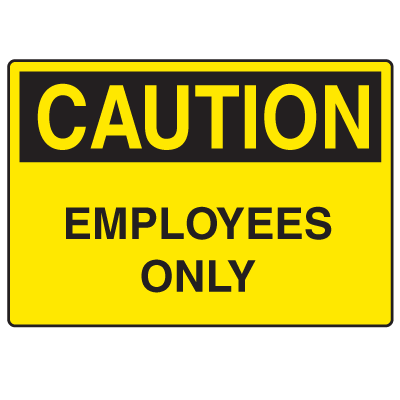 Be sure to put these Employees Only signs up where they can be easily spotted. After all, a sign is only as good as its visibility. These Notice signs prevent customers from accidentally entering restricted areas and causing issues with security and safety. The use of these signs significantly lowers the occurrence of accidents by keeping customers from entering unsafe areas. These also help deccrease security problems by limiting the access of unauthorized personnel to such areas. A variety of Restricted Area signs are available in different designs with some using internationally recognizable symbols. There are also a number of bi-lingual signs that can be used by businesses that deal with with non-english speaking individuals as well. In addition, these Employees Only signs also help keep the personal property of your employees and your stocks safe by preventing unauthorized access to storage areas and locker rooms. Mounting these facility signs can be pretty simple and easy if you have the right equipment and tools to do so. With our many different mounting options here at Seton, you can ensure that your signs are properly mounted and are highly visible to those who need to see them. Just make sure to put these signs in well lit and highly visible areas. 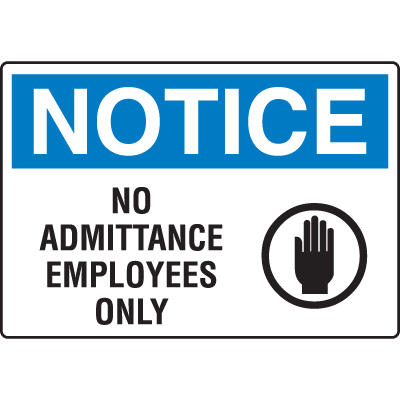 With these Employees Only signs you can help increase facility safety and can set boundaries for security.